One day in 1973 a friend gave John and Sally Bauers a bottle of David Lett’s (Eyrie Vineyards) “Oregon Spring Wine”, which was a blend of red and white grapes. The couple was captivated by the aromas and taste. A short time later John decided they needed to buy land and develop a vineyard. Dr. John Bauers was a practicing osteopathic physician originally from Ranka, Latvia and Sally was from Kansas. At the time they discovered Oregon wine they were living in Oak Grove, Oregon with their three children. In 1974 the Bauers purchased a 15 acre filbert orchard on Worden Hill Road near Dundee. At about the same time they also bought a five acre vineyard recently planted by Jim McDaniel on the other side of the road. Later they purchased another five acres and moved into their house on this property. The Bauers planted their land to various grape varieties in 1974-1975. Francis Wallace was their long time vineyard manager. Over the years grapes were sold to Elk Cove, Erath, Eyrie, Rex Hill and Lange Winery. In 1999 the Bauers sold the property to former Oregon Governor Neil Goldschmidt. 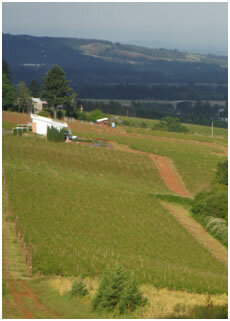 In 2006 the property was then sold to Winderlea Vineyard and Winery.